Corporate 9’s – well…. where do I start, we ended up finishing in 7th spot out of 16 teams, which was quite amazing as all the other teams had a few extra weeks to prepare and we just got dumped into it. Then we played in the finals where we were beaten in all our finals matches… General attrition meant that we lost a few players on the way through injury, and others through lack of commitment. Pretty standard stuff really… So whilst the top teams finished off the season, I hosted a BBQ at my place where we all had a few beers, some kai kai, a swim, and many laughs. Every member of the team received an award (verbal of course) but our MVP got a bottle of Scotch to take home. It was a nice afternoon and all the boys are keen on other comps that we can get stuck into. We spent Christmas down in the deep south of NZ with my other family, before heading back up to the far north to spend time with Jacinta’s. I actually ended up buying a $2000 car in Auckland as it was just as cheap to buy one and leave it at the in-laws, than hire one all the time. 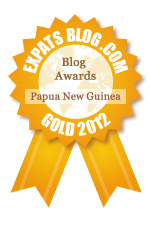 Coming back to PNG, I had the place to myself again – and no money. It seems my wages got stuffed up and didn’t go through. Lucky I had some spare cash hanging around, got the bank issues sorted and got paid. A week later – the bank took all my cash out of my account for no reason… pretty damn stressful and frustrating, but lucky we have great friends who lent us some weekend money and I ended up spending 5 hours in the bank come Monday trying to sort out the mess. success. It is stuff like this – that really makes you tired.